Teepees! I love teepees. When I was younger, I used to make some teepees out of paper pretending that my paper dolls where Indians. It sure is fun. I have this curiosity about teepees especially the different designs on its fabric. Aside from the actual home, these also look cute when added to your kid's space or other areas of the house. You can make your own teepee or buy one that is ready made. But it would be more fun if you make one. All you need are poles, some string and a fabric. You can even decorate it with flowers, bows, pompoms and others. I have recently made a post about teepees in kid's bedrooms and I wanted to show it you too. I want to showcase different possibilities and ideas on how you can bring in a teepee to your home whether that is inside or outside the house. You can also see some ideas on what to do with your beautiful tent. 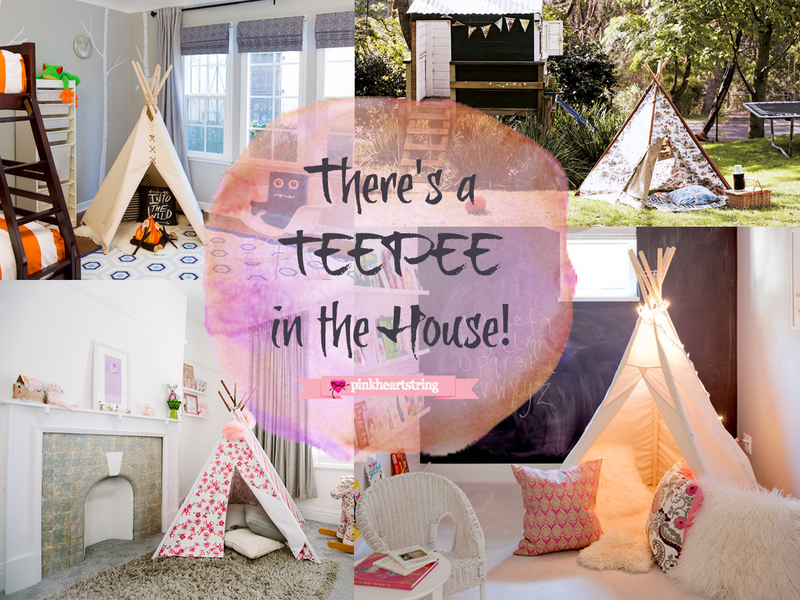 For sure, your kids (and the inner child in you) will feel very excited to have a teepee in the house. Well, I feel that way and Bella wants one too. Gathering poles together, you can make a teepee with a series of lights around it. Then surround it with pillows and stuffed toys just like what they did to this play room. If you want one for a princess, then get a fabric with pretty pink flower prints and add some floral decors or even pompoms! For a boy's bedroom, a plain colored teepee will do. But you can also use one with printed fabric like stripes and others. What I love about the bedroom below is the fire, firewood and marshmallows in the tent! Aside from the bedroom, it can also be added to the living room like this one. Look at how they decorated the teepee and how it added a fun appeal to the living area. Or you can bring the teepee outdoors too! Use some pretty fabrics and bring with you large comfy pillows. This will surely be the kid's best day ever! Aside from a tree house or a fort, you can add a teepee for your kid's outdoor play area. It could be a lovely spot for a picnic too! And you know what's cute? You can also use a teepee for photoshoots just like this adorable baby! And if you don't have kids or you just love your pets so much, then make one for your cat or for your dog. Apart from being a sleeping or resting spot for your pets, it can also be an additional decoration to your home. Looks fun, right? I know you love this amazing inspiration of teepees for your home! What are you waiting for? Make one for your home and you'd surely make your little ones happy. Aside from that, you can add a whimsical touch to your home- both inside and outside. It's so cute! It also is a great place where kids and grown-ups could cuddle and read together. I love tepees! (Or tipis or teepees) In fact, I was just looking at a charming one this morning. Is this a sign? Haha! The teepees in the photos look so cute!